In 1868 W.S. Gilbert wrote a one-pace illustrated comic piece for ‘Fun’ Magazine. Entitled Trial by Jury, it drew on his experiences as a barrister and satirised the legal system, spoofing a trial over a ‘breach of promise’ arrangement of marriage. When Gilbert was approached by Carl Rosa, composer and opera manager, in the autumn of 1873 to create a libretto for his newly opened company, he immediately planned on using Trial by Jury. Unfortunately, in 1874 Rosa’s wife, Euphrosyne Parepa-Rosa, died in childbirth and, as she was to sing the lead role, Rosa lost interest in the project and dropped it. Gilbert struggled to find anyone to take on the opera libretto but, after mentioned his little one-act comic opera to Richard D’Oyly Carte in1874, Carte suggested he collaborate with Arthur Sullivan. Gilbert and Sullivan had previously collaborated for Thespis in the winter of 1871-2 but, due to work commitments, hadn’t since. Luckily, Sullivan loved the script, agreed and wrote the music in a matter of days – leaving them free to assemble the cast and begin rehearsals in a matter of weeks. 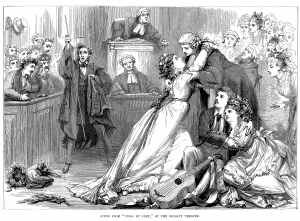 Trial by Jury premiered in the London Royalty Theatre on 25th March, 1875. Despite being shown as an afterpiece to the main performance and beginning at eleven o’clock at night, Trial by Jury was an unexpected hit. This one-act comic opera, was a little over 30 minutes long, but it continued to be a popular choice, accruing 131 performances and touring as far as Australia. More than that, it later went on to become the most desirable supporting piece for any London production and created a valuable template for future creations between Gilbert and Sullivan. It paved the way for their future operettas to follow a similar route and use the chorus as an essential part of the action – something that was unheard of at the time. It’s also worth noting that it is the only theatrical work by W.S. Gilbert to contain no spoken dialogue – making this little one-act comic opera, an important part of W.S. Gilbert and Arthur Sullivan’s place in history. The Grim’s Dyke was owned by W.S. Gilbert (and then his wife, Lady Gilbert) from 1890 to 1936. In celebration of such a renowned owner, The Grim’s Dyke Opera regularly perform full-costumed Operas. Please see our Entertainments Calendar for up and coming performances.